The girl in the tree was 18, maybe 19. I forget her nom de treesit, something like “Squirell” or “Moth”. She did not and would not come down. My kids made her cookies. We yelled up to her one day, “hi there! we support you!” she was just a kid. Blonde hair, red face, wrapped up tight in a donated sleeping bag and tree-top tent complete with cell phone and water jug. Of course we had to leave the cookies at the bottom of the old Oak. Three or four other trees were occupied. This was way before Occupy. They were organized. Several people manned a table with flyers, and also managed food donations, media relations. They were the “treesitters” and the Treesit went on for months. 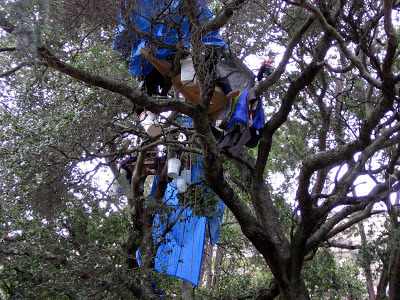 UC Berkeley planned to remove the old grove of noble, serpentine branched Oak trees to expand building around the football stadium. There were maybe 20, 25 trees that made a beautiful shady grove between streets, nestled next to the old stadium. Was it on scared ground as was claimed? I don’t know. I do know it was a beautiful grove, and they were stately trees. They planned -and have now built- some form of “high performance center” on the site, which i’m sure will hold a state of the art weight room and other modes of sparking “high performance”. Yesterday, for the first time in the newly remodeled stadium, with new high performance center attached, UC Berkeley played Stanford. They lost to Stanford 21 to 3. Cal was powerless, listless, clueless, and almost pointless. 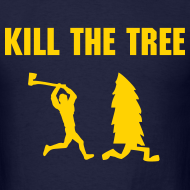 Stanford’s mascot is not the cougar, wildcat, hurricane, bear, crimson, panther or shark- it is a tree. The winner of the Big Game, (of which this was the 115th) gets to keep the Axe. The Boston Red Sox traded Babe Ruth and were cursed for almost a century for the mistake. Cal won’t beat Stanford till they fix the Karma. Start planting.